Baby banana plants, the never-ending staple of the Polynesian diet, are called "keikis" (kay-keys). 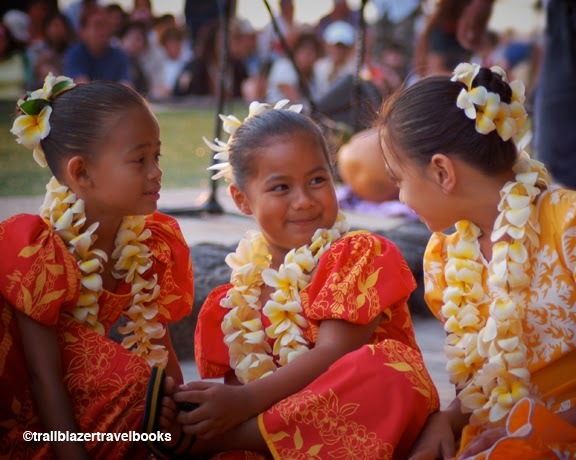 Young children are also called keikis, since the youth represent the perpetuation of Hawaiian culture. Kids join their local hula halau (group) about as soon as they can walk, and many stay in the group of 50 years or more, teaching their skills to each new generation. The dancing and chants of the hula tell the stories of the Hawaiian people and places, a history that preserved without the written word until the missionaries came in the late 1700s. Dancers often make their own dresses and weave leis from plants from the forest (these are plumeria). 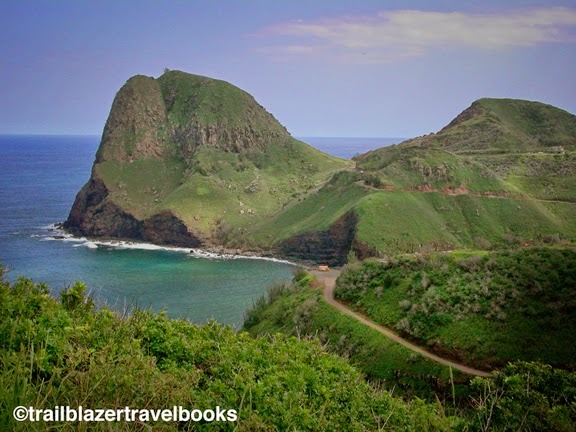 Kahakuloa Head—known as the Tall Lord wearing a feather cape to early Hawaiians—is a West Maui landmark that can be seen along the Windward coast from Kahalui to Ho'okipa. Most people drive right on by while taking the white-knuckle narrow highway north from Lahaina through Kahakuloa Village. Portions of the road are barely one lane, so you need to take a gander from up high to make sure the school bus isn't coming up. There is a several-car turnout at the head, at the saddle it shares with Pu'u Kaahulianapa (pictured on the right). You can walk an eroded trail between these two mini-mountains to a cliff-side overlook. Moke'ehia Island Seabird Sanctuary is visible, and it is common to get fly-bys from tropic birds and other winged mariners. During the winter, humpback whales like to swim close by the Tall Lord and the acoustics are such that you can hear them exhale. 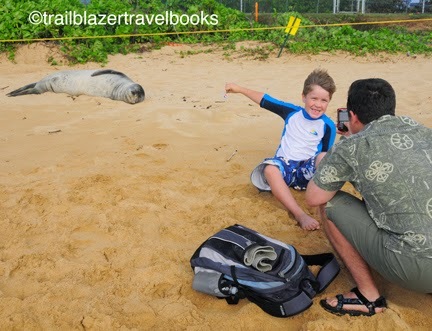 See Maui Trailblazer, page 78 for more details on this remote section of the island. 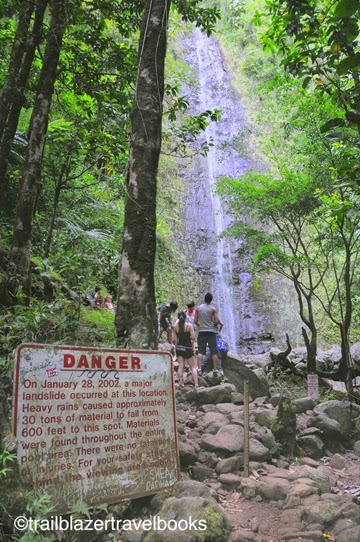 Students of BYU-Hawaii take a break with a 5.5-mile hike to Laie Falls, climbing 1,400 feet to a stream valley that is pocketed into the Ko'olau Mountains. You begin on a red-dirt road and ascend to majestic copse of Norfolk pines. 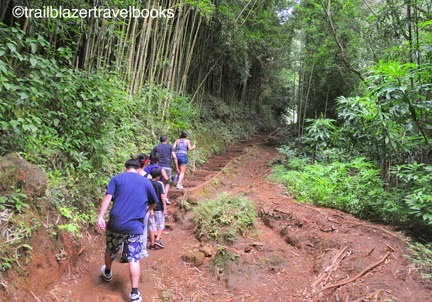 The trail then burrows through a forest of strawberry guava. At a narrow section, the falls trail drops steeply into the drainage—a rope aids the descent, but the hike is not dangerous. A second falls and pool lies below the one pictured. Energetic hikers can stay on the trail to the top of the Ko'olau Ridge, an excursion that adds six miles and another 800 feet of climbing to the day. 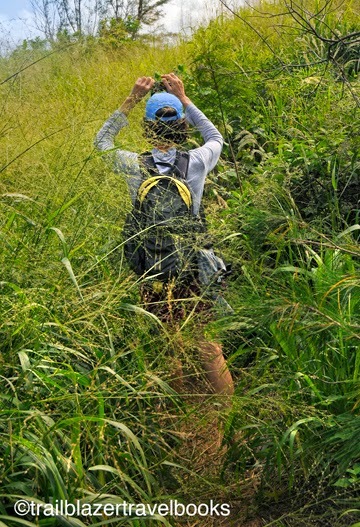 It's overgrown and steep, so prepare for a full-fledged trek. 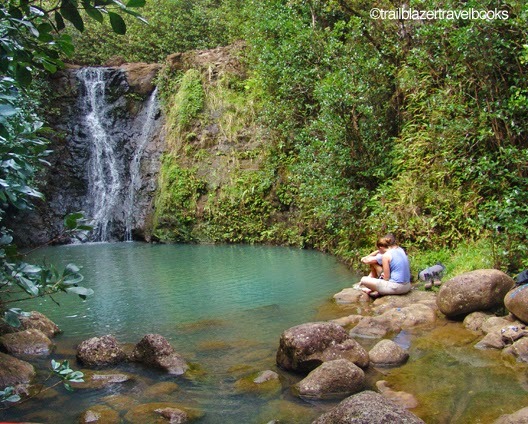 See Oahu Trailblazer page 150 for more details on Laie Falls, plus several other excursions that are not far from the Polynesian Cultural Center. What’s Best: Comb the east side’s longest beach, looking for coral and shells, and watching Hawaiian net fishermen. You get far away in an instant. Parking: First (easiest) Nukoli‘i access: From Lihue or the airport, head toward Kapa‘a on Hwy. 56­­—from the jct. of Hwys. 56 and 51. Turn makai on Kauai Beach Dr., .25-mi. past mm3, toward the Hilton Kaua‘i Beach Resort. Turn right just before resort lot, and follow the road .4-mi. 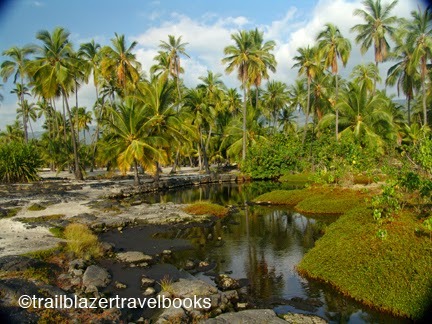 around to developed lot, which is Nukoli‘i Beach Park. Second (prettiest) Nukoli‘i access: Continue .5-mi past Kauai Beach Dr., nearly to mm4, and turn makai on a dirt (Nukoli‘i Beach)road along the edge of the golf course. Follow the road, which may have major potholes, around to parking area among ironwoods at beach. Starting at the beach park (which is maintained by the resort) at the first Nukoli‘i access, take off down the each to your left as you face the water. Nukoli‘i is also called Kaua‘i Beach and Kawailoa. Aside from a camper or two, this beach sees few visitors, especially beyond the immediate grounds of the resort. 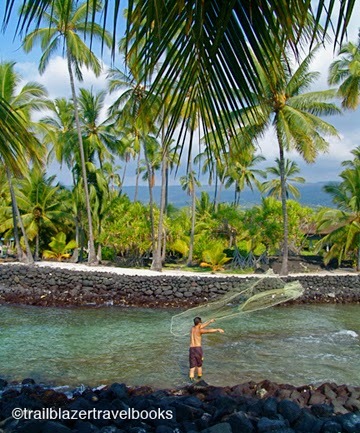 At any time of the day you may see net fishermen, plying their ancient trade and if you'r lucky, a solitary monk seal out for a sunbath (keep your distance). About .5-mile from the beach park, you pass the resort, where you cross a ditch. A sandy road, closed to vehicles, parallels the beach. Nukoli‘i extends more than two miles, joining the beach behind the golf course—where the second access area described above brings you in—and continues seamlessly to Lydgate Park." 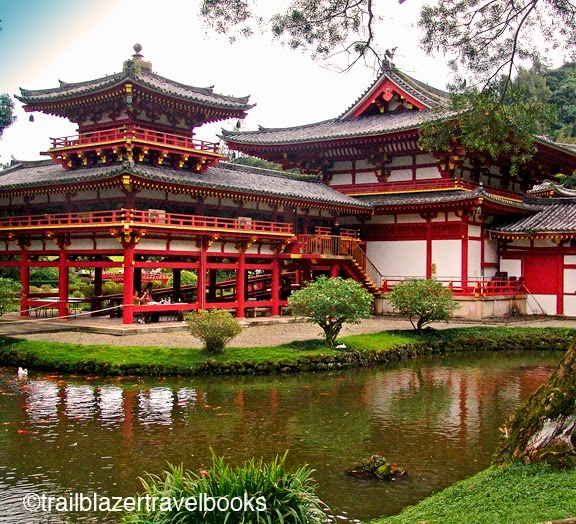 The serrated ridge of the Ko'olou Mountains hovers over the Valley of the Temples on Oahu's Windward Coast, an inspiringly spiritual setting for the Byodo-In Buddhist Temple. Built in 1968 as a 100-year memorial to the first Japanese immigrants to Hawaii, the ornate structure is a replica of a 1,000-year-old temple in Kyoto Japan. It's fronted by a large pond that is home to all sorts of water fowl, and the architecture is meant to portray a Phoenix rising from the ashes. Inside a main room is the 18-foot tall Amida, the Buddha of the Western Paradise, gold-lacquered and seated in a lotus position. A tea house and gift shop are nearby. You are free to roam the 10-acre gardens that surround the temple. A gazebo houses a seven-foot bronze bell, the gonging of which, accompanied by a small donation, is said to rid the mind of evil temptations. Ah, were it that simple. See page 123 of Oahu Trailblazer for more on the Valley of the Temples and other sights along this non-touristy portion of the coast. Hawaii's Huli Huli Chicken: Hoo Haw! Be prepared. If you see smoke ahead while driving in Hawaii, get ready to jerk the wheel, skid to a stop, and hit the ground running. Huli huli chicken is on the grill and it's first come, first served. 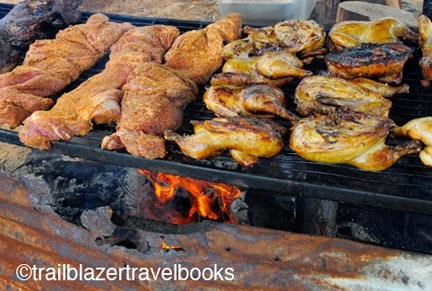 Roadside barbecues are often set up in rural areas, like going north from Anahola on Kauai, near Kawaihae on the Big Island, at Haleiwa on the North Shore of Oahu, and near Big Beach on Maui. On weekends, beach park parties feature huli huli, and and you're certain to score the tangy-sweet meat at any outdoor event that has food. Kind of a mix between teriyaki and Texas, recipes for this Hawaiian treat are guarded by the practitioners. But you can count on soy sauce, ginger, sherry, and brown cane sugar to be among the ingredients. The flame, most often supplied by wood chips, is kept hot (often resting on corrugated metal) and grillers must take care to keep the chicken turning—huli huli means "turn turn". At major events, the sooty-and-sauce-stained chefs move like conductors in a symphony orchestra. Bethany Hamilton, a child prodigy as a surfer, overcame a shark attack at age 13 that left her with one arm and nearly took her life in 2003. Her 2006 biography, "Soul Surfer," was made into a major motion picture (Dennis Quaid and Helen Hunt as her parents, and Anna Sophia Robb as Bethany) that will be released tomorrow. The girl from Lihue, Hawaii, is in New York, New York, on and all-out-blitz media tour. Bethany wowed surfing fans early, as an eight-year-old competitor at the Rell Sunn Surfing Invitational at fabled Makaha Beach on Oahu. That was the start of five year's of phenomenal success—until that October morning at Tunnels Beach on the North Shore of Kauai when a 14-foot tiger shark that was hunting for turtles took her arm at the shoulder instead. If the bite had been an inch higher, she would have bled out on the spot. But friends used a leash from a surfboard as a tourniquet and she was rushed across the island to a hospital—taking the place in the operating room of her father, who was scheduled for knee surgery that morning. Bethany is a joy to watch—a marriage of grace and power. She is able to spot the right wave, get in position, and catch a ride with deceptive ease. Just watch the other surfers in the the same conditions, who seem to flail with much more effort to make it happen. BTW: She is not related to big-wave surfer Laird Hamilton, who is moving to Kauai from Maui. 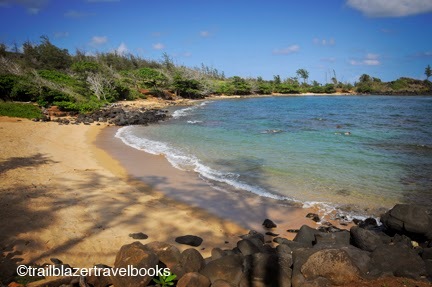 House (Anapalau) Beach is a walk from Donkey Beach, which is a walk from a highway trailhead in east Kauai near Kealia Beach—which means it is way off the radar for most visitors. On weekends you may see a couple Hawaiian families and even dirt-bikers tearing up the red dirt trails that come in from another direction on Anahola's backroads. But most of the time this sweet cove is the sort of place adventurer seekers lust after. The snorkeling is good-to-excellent. One end of the beach (pictured) has a sandy entry and is perfect for kids. Fish-viewers also can walk around the cove to a rocky point and swim back toward shore. The walk from the trailhead is only 2-plus miles roundtrip, with 200 feet of elevation, though hikers can make longer by missing a turn in the grass and wandering inland. No matter, keep going down the coast and you'll find it. BTW: There is no longer a house here. 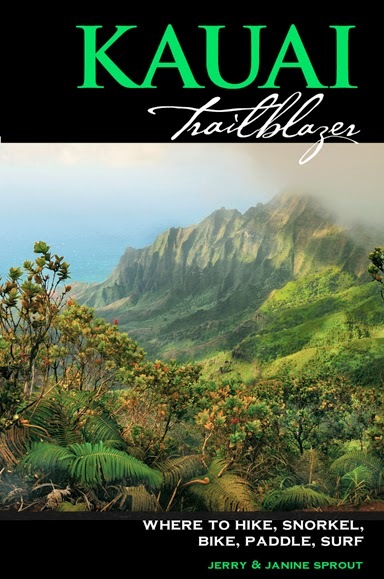 See Kauai Trailblazer page 71 for more details.